With the change of seasons comes a change of weather, especially here on Long Island. No one likes slippery winter road conditions, but 4MATIC® all-wheel-drive gives you an added boost of confidence when you’re on the road and the weather turns. 4MATIC® isn’t just any typical all-wheel-drive system. 4MATIC® fully integrates with the drivetrain, as well as the large variety of safety and assistance system that comes on a Mercedes-Benz. The 4MATIC® system detects driving conditions and adjusts as needed to give you the most traction and confidence to take on the road ahead. During normal conditions, the system channels the engine’s torque to the front and rear wheels through a center differential, for sporty balance and responsive handling. 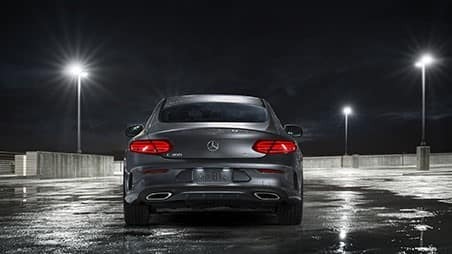 However, when mother nature decides to change up the road conditions, the 4MATIC® system reacts instantly by sending power to whichever wheels can use it best, giving you the driver maximum control in unfavorable conditions. The concept of the 4MATIC® all-wheel-drive system dates all the way back to 1903, when Paul Daimler created the first designs for an all-wheel-drive system. This led to the first all-wheel-drive car for everyday use being put into production in 1907, the Daimler “Dernberg-Wagen”. Fast forward to 1972, development began for the Gelåndewagen, a cross-country SUV. 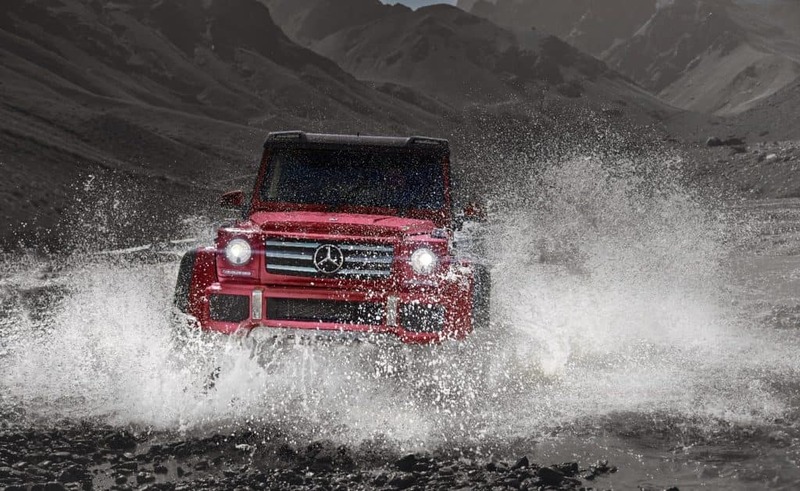 This SUV is known today as the G-Class. Then, in 1985 Mercedes-Benz engineers introduced a new passenger-car AWD drive system at the Frankfurt Motor Show, naming it 4MATIC®. Two years later in 1987, 4MATIC® made its big debut, being featured in the W124-series E-Class. 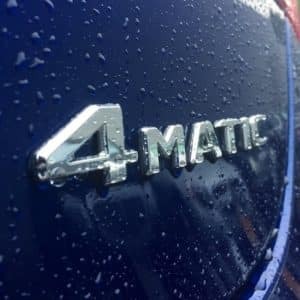 Compared to vehicles that do not have 4MATIC® all-wheel-drive, here are just some of the many benefits of having your vehicle equipped with 4MATIC® all-wheel-drive. Better acceleration – In inclement weather, you will find that your 4MATIC® Mercedes-Benz would accelerate much smoother and faster than a vehicle that is not equipped with 4MATIC®, such as a front-wheel-drive or rear-wheel-drive vehicle. Helps with traction and towing – If you are interested in a Mercedes-Benz SUV that will be towing trailers or equipment, than 4MATIC® is essential for a smooth towing process. For example, if you are towing a boat from a wet and steep boat ramp, the added traction will be a huge benefit and prevent your vehicle and the trailer from getting stuck. Improves handling – the biggest advantage of 4MATIC® all-wheel-drive is the superior traction in inclement weather events. Since all four of the wheel are given power with all-wheel-drive, more traction is given to make the vehicle continue to move on and not get stuck or lose traction. Better performance – For those looking for the most power possible in a vehicle, you will want to look into 4MATIC® all-wheel-drive. The additional traction gives 4MATIC® Mercedes-Benz vehicles faster acceleration times and more power on the road, especially on the Mercedes-AMG® 4MATIC® equipped vehicles. Today, 4MATIC® is available on more than a dozen Mercedes-Benz models, including sedans, coupes, cabriolets, and SUVs. The 4MATIC® all-wheel-drive system has a historical legacy of giving the driver the confidence to take on the road ahead of them, and get them where they need to go. At Mercedes-Benz of Huntington, we have many 4MATIC® models available in our showroom. Come check them out today or give us a call at 855-777-9693 for more information! 0 comment(s) so far on What Are The Benefits of Mercedes-Benz 4MATIC® Vehicles?